Happy Halloween everyone!! I hope you have something fun and ghoulish planned for this evening!! 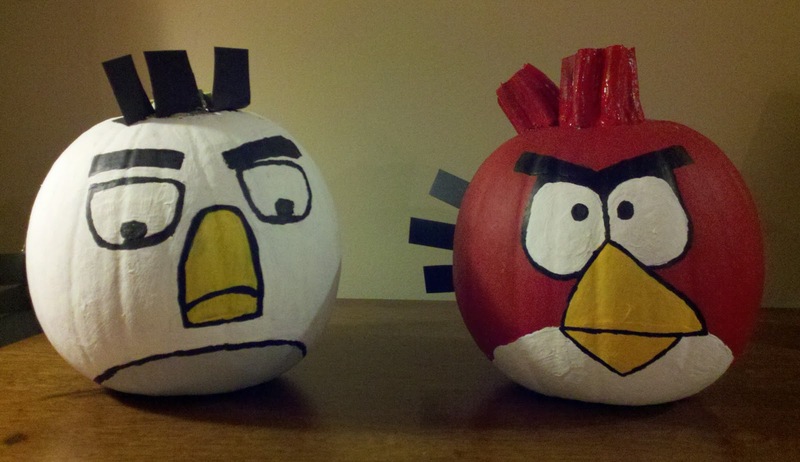 My boys are excited for trick or treating tonight and last night they decided to paint their pumpkins- like Angry Birds! It came out great and dh and I did some of the detail outlining, but the boys did all the planning. The picture is below. 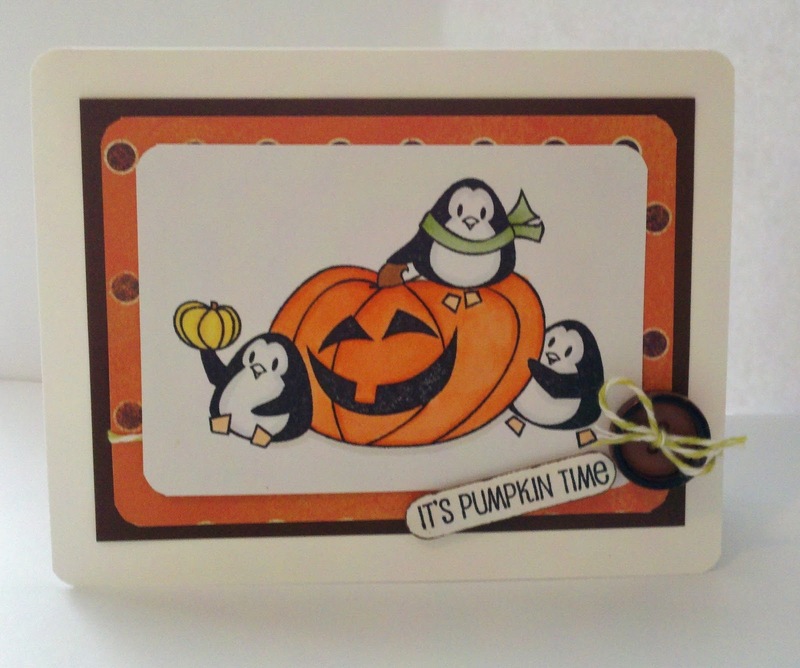 Today I just want to share a quick card I made using The Cat's Pajama's set of Little Pumpkin. These penguins are just the cutest!! I colored the main image with Copics and used some old dp I had that I do not know who made. 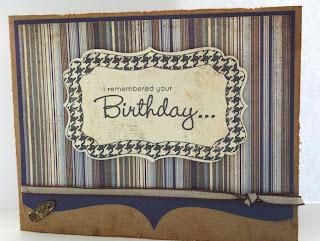 I finished off the card by rounding the corners, adding some fun twine from MFT, and a button. I hope you all have a great day and Halloween!! Thanks for stopping by! Hi everyone! Wow! It's amazing how your week of having nothing becomes full of appointments in an instant! Mostly for my kids, but appointments nonetheless! I had a free 30 minutes that I thought I would whip up a very quick birthday card for a friend that I always seem to screw up his birthday! It's very simple but says exactly the truth! Lol! 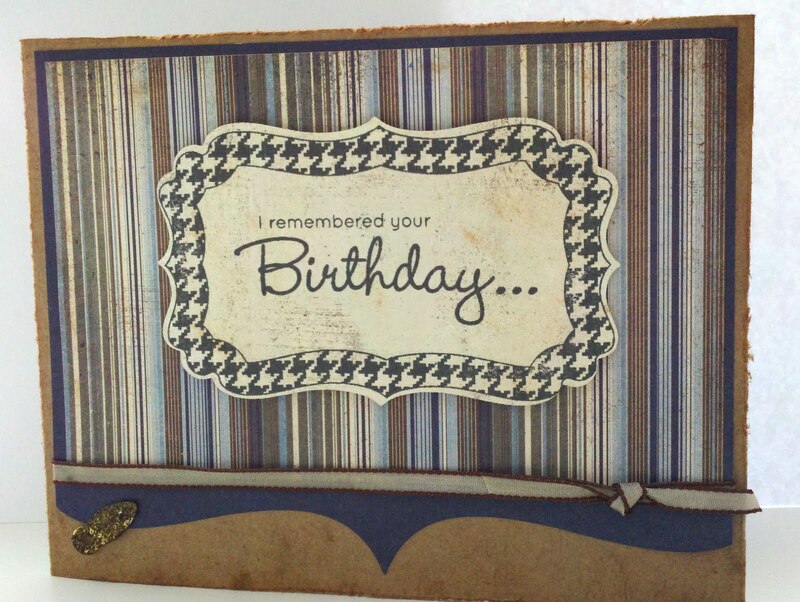 I used MFT's die-namics stamp set and Basic Greys Granola collection. The outside tab is from the die collection of The Cats Pajamas. I distressed the edges, used Tim Holtz Distress ep for the top of my embellishment and popped up the center sentiment. I finished it off by using sone distress ink all around. The inside sentiment is from MFT's tongue in cheek collection... It says "Hell has officially frozen over." It's quite appropriate for this friend.. Lol! Thats about it for me today! I'm now off to my kids award ceremony and another appointment! Ugh... Thanks so much for stopping by! I was in the process of making a thank you teacher gift when my child decided he wanted something else for her that apparently he says she really needs! So... That left me with an unfinished project to share, but I do have one I made in the spring for his last teacher that I did not get to post. It is above. (Blogging on the go doesn't allow for moving pictures...) For this project, I used coasters which I covered with dp by DCWV and used my Crop a dile to make the holes for threading. I thread the coasters with some twine and utilized some large ric rack for the back and sides. 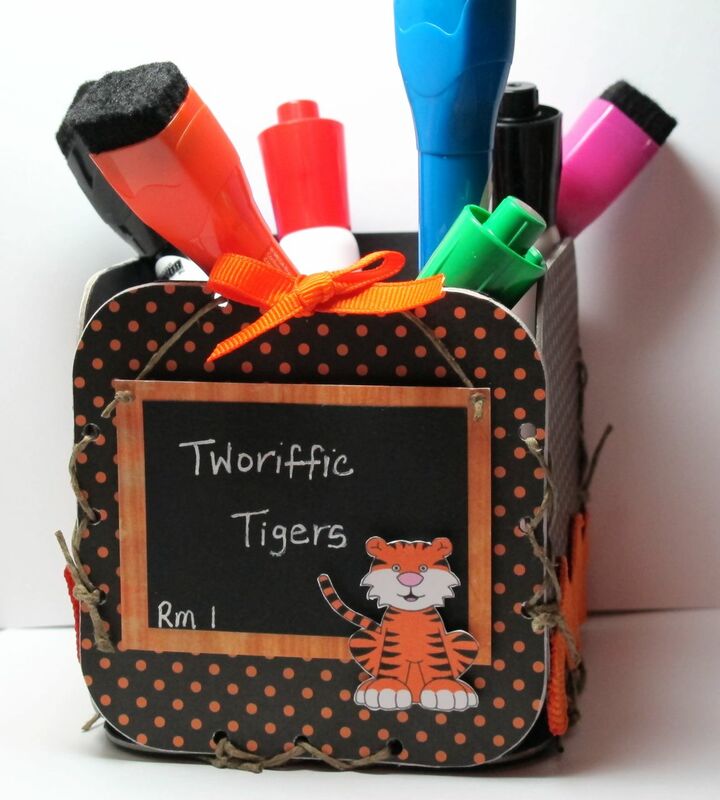 For the front, I made it look like a chalkboard and printed out a tiger from the computer which I cut out and popped up. His class were the tigers and known as the Two-riffic Tigers. The teacher was in need of new white board markers which I filled it with. This is rather simple and a quick gift that you could make unique for someone to place on their desk! Thank you for stopping by and if you are one of my blog candy winners, be sure to get in touch with me! Have a great weekend! Happy Wednesday... I have the 4 winners for the paper giveaway! Not too hard considering there were not many if you for the random numbers to be chosen! Lol! Thank you all for entering and I will have more giveaways over the next few weeks! Totally CUTE... They are getting so tall,oh my goodness. Great photo of them together. Already a follower (from the blog hop). Thanks for the chance to win. Please email me your information and I will get those goodies out to you! Thanks for stopping by and I hope you all have a great day! 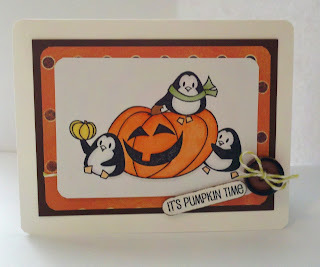 Thank you everyone who stopped by to take a peek during the Blog Hop this weekend!! All your comments were very kind and I look forward to visiting all the new blogs of those who left me your links!! We have some winners!! If you weren't chosen, I have some candy that I am giving away until Wednesday! So you have time to enter again! Just click the picture at the top right!! Amanda... please email your address so I can get your goodies out to you!! 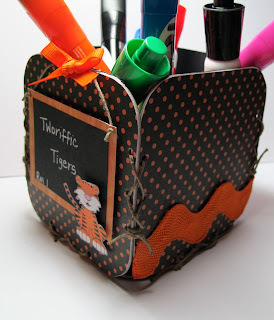 Happy Sundayand welcome to day 2 of Angela's Craft Corners Blog Hop! If you have begun here then you need to hop to Angela's Blog at http://theblingtheory. blogspot.com first! 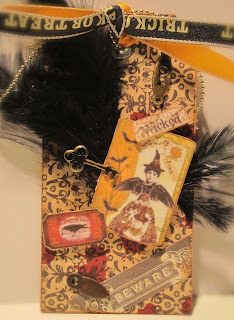 Today, I have created a Halloween tag and one of my first altered art types. I'm not great at altered art, but I really like it and feel like Halloween is perfect for it! I used a digi download for the images but used MS dp for the covering of the tag. I added some black feathers and metal embellishments along with coordinating ribbon. The images are popped. I used PTI's Spooky Treats II set for the stamped sentiment on the back. My intention is to attach this to a wine bottle which is why I chose witches brew. 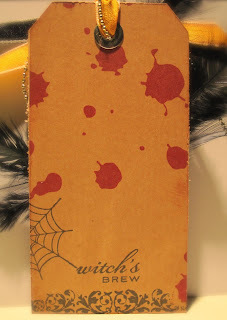 I finished the tag by distressing the edges and doing direct ink to paper distressing using Tim Holtz Tea Dye ink. I've got another blog candy giveaway for today which is a Rusty Pickle Halloween Collection papers, stickers, and alphabet stickers! I apologize for no picture as I'm doing this post on the road! I had to go to the airport early this morning.. I will edit and post a picture as soon as I get back home. Again, this is open to those in the US... Sorry! I will pick a random winner tomorrow AM for both yesterday and today! Good luck! A Ghoulish Hop on World Card Making Day! Happy Saturday and World Card Making Day!! But first really, I have to say Happy 10th Anniversary to my dh... It has been an adventure and I am looking forward to many more the next 10!! Thank you for stopping in and being able to peek at the many great projects ahead as well as your chance to win some Blog Candy!! My project is a haunted house candy jar. It started off as a plain paper mache house which I painted and turned into something fun for Halloween. Here is the front of the house. I started off with using Tim Holtz Distress EP around the windows to give it a "broken" feel. From there, I painted the entire house inside and out with black acrylic paint except the roof which I used metallic acrylic paint for a copper look. Once dry, I lightly went over the roof with some black paint to make it look old. I followed that up with using Modge Podge on each side, one at a time, and covering it with black glitter. One side of the house. Here, I used a MS sticker of a tombstone. I added some spainsh moss around it. For the windows, I used some orange textured cs run through the CB with the sticks embossing folder, cut out to size and used some decorative scissors for the ends. I then ran over lightly with a sponge and black ink and popped it up using some mounting tape. For the chimney, I used some craft wire and some decorative bat appliques for the look of the bat flying out. I added some black feathers and spider webs to finish it off. This is the inside with candy. The left corner of the house I used some mini picket fences that I had for quite some time which I painted and added some glitter to. I then glued it to the corner of the house adding some moss and feathers for the finished touch. This is a closer look of the tombstone side. I did add some googly eyes to the windows which first, I placed some transparent sheets on the inside for the eyes to stick. Finally, the front area, I bought a mini broom which I cut to size, painted and added some glitter to place on the front. The door was made running it through a CB folder and distressing it with a sponge and ink. I used PTI's sentiment from Spooky Treats II to cross over the door. I then finished the house by adding some ribbon along the bottom side and adding some chipboard over it for stability.